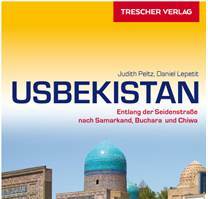 La antigua ciudad de Jiva es la perla del oasis de Khorezm. Khiva is located in the ancient cultural oasis – Khorezm, in the north of Uzbekistan,the name of which means “Earth of Sun” and was first remarked in the I millennium BC, in holy book of Zoroastrians Avesta as «Hvairizem». Khorezm state was founded on the bank of the great river Amu-Darya and it is of the same age as Urartu and Babylon. Khiva was a favorite place of many travelers and caravans as it was always supplied with water. Khiva played a great role in the economy of Mavaraunnahr as the caravan road – one of northern lines of the Great Silk Road went through this town. In 996, with the creation of the ruler of Khorezm Mamun ibn Muhammad “Khorezm Mamun Academy,” where they lived and worked in the greatest scientist of the ancient East: Al Biruni and Abu Ali Ibn Sina (well-known as Avicenna in Europe), the city acquired the status of research center. Khiva survived hard time and decline during invasion of Khorezm by Genghis Khan, ancient monuments were destroyed and burnt. During governing of Abdulgazikhan in 1643-1663, Khiva became more powerful and since then it was called Khiva Khanate. Today Khiva is a unique monument of town-building surrounded by double ring of historical city walls – Ichan Kala (Inner town) and Dishan Kala (Outer town). Khiva is compared to a fairy town from «One thousand and a night». In the inner town (Ichan-kala) were religious, administrative and economic centers: Friday Mosque (Jami), madrassah, mausoleums, palaces, khans, many bazaars and caravanserais. A relatively small area located about 60 madrassah, many mosques, two palaces for the rulers, homes for court Khan and many others. The minarets – Kalta Minar, Islam Khodja Minaret, Murad Tura Minaret are considered to be the main panoramic view of Ichan kala. By visiting the Kunya Ark (Old Ark fortress), one can imagine the life of Khiva khans. The Palace-Fortress consists of several palaces that accommodated the throne hall, harem, arsenal, mint, garrison and etc. The square at the Kunya ark was main parade-ground and a training place for the troops of Khiva khans. Numerous guests of Uzbekistan endeavor to visit Khiva – a fabulous town-museum in the open sky.